Splits have emerged in the family of former Ugandan leader Idi Amin over the distribution of his wealth following his death. However, his second-oldest son Kirunda Amin told BBC News Online that the Amin family would remain intact by following Islamic law on inheritance. Amin's 54 children, many of whom reside in the US and Europe have been flocking to the Saudi Arabian capital, Jeddah, to view their father's grave, according to Kenya's Daily Nation newspaper. The children have also been enquiring from one of Amin's 13 wives, Hajat Madina, about arrangements for the last funeral rites and the installation of the heir. Kirunda Amin said that although there have been disagreements on inheritance, the situation is not yet out of hand. Amin, who was variously described as 78 or 80 years old, died of multiple organ failure at King Faisal Specialist Hospital in Jeddah on 16 August. "I am here in Uganda. My brothers are living elsewhere and, God willing, we shall all rely on religious elders to distribute the wealth and chose the heir," said Mr Kirunda. According to Mr Kirunda that task should not be difficult. "My brother Taban is the oldest in our family and he should automatically be the heir. We have survived and must continue surviving as a family". The former Ugandan military leader owned property in the north-western district of Koboko and in the capital, Kampala. The Uganda Muslim Supreme Council, established by Idi Amin soon after he came into power in 1971, agrees that there is wrangling in the family over wealth distribution and is trying to mediate. The Council's Secretary for Education, Ismail Icum, told BBC News Online that Amin's children had agreed to adhere to Islamic law to solve the issue. "The council and the children have appointed a panel that will deal with the whole issue of inheritance," said Mr Icum. The Uganda Government has said Amin's family would not get benefits that former presidents are entitled to because of his violation of human rights in the country where up to 400,000 people were killed by his agents. 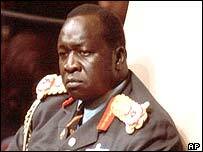 Idi Amin was toppled in 1979 by a force which included the current President Yoweri Museveni. President Museveni said he was not in mourning for Amin. He also said that he had personally vetoed suggestions from some government officials to win votes in Amin's home region by according him a state funeral. "I would not bury Amin. I will never touch Amin. Never. Not even with a long spoon," he said in his first public comments on Amin's death.